1. Mix the bread fl our, salt, spices, sugar and yeast in a large bowl. In a small pan, warm the milk and butter over a low heat until the butter is melted. Add the zest and raisins and leave to cool for 2 - 3 minutes until just warm, then beat in the egg. Make a well in the flour mixture and pour in the milk mixture, stirring to make a soft dough. 2. Tip the dough onto a lightly floured work surface. Knead for about 5 minutes or until smooth and elastic. Form into a ball and put in a lightly oiled bowl; cover with clingfilm. Leave in a warm place to rise for 1 hour, or until doubled in size. 3. Tip the risen dough onto a lightly floured work surface and flatten to knock out some of the air. Divide it into 9 pieces (around 100g each) and roll into balls. Place about 2cm apart on a baking tray lined with baking parchment; lightly cover with greased clingfilm. Leave to rise for about 40 minutes. 4. Preheat the oven to 200˚C, gas mark 6, and remove the clingfilm. For the crosses, mix the plain flour and 5 tbsp water into a thick paste. Spoon into a piping bag fitted with a small nozzle (or use a plastic food bag with a bottom corner cut off ) and pipe on the crosses. Bake for 20 - 25 minutes. 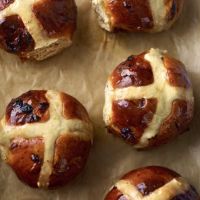 Gently heat the golden syrup in a pan and brush over the warm buns. Cool a little before serving. This recipe was first published in Mon Feb 20 10:57:00 GMT 2012.